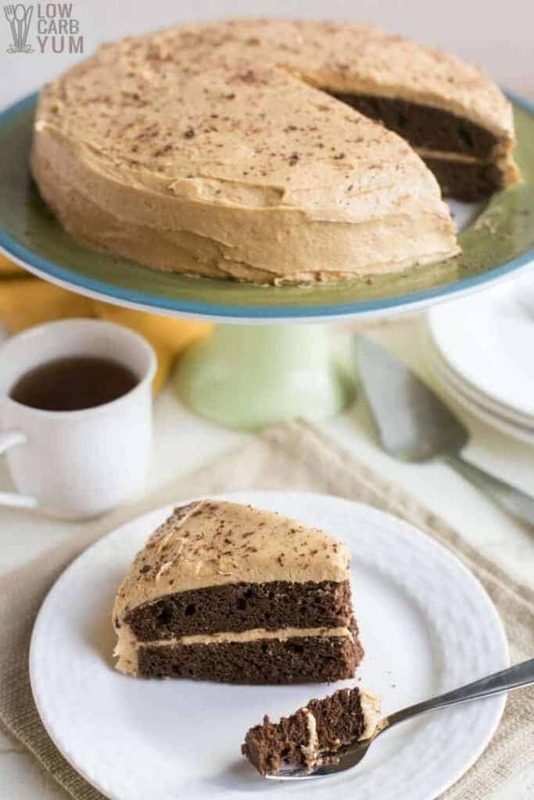 An easy to make low carb chocolate peanut butter cake. It’s a moist chocolate cake topped with sugar free peanut butter frosting. Disclaimer: This post has been sponsored by LC Foods, but all opinions are my own. In celebration of the LC Foods 10 year anniversary, I baked a cake using some of my favorite products from their online store. And for the rest entire month of January 2019, you can save 10% off by using coupon code 10YEAR. 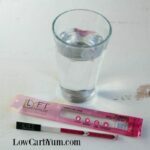 I’ve been shopping at LC Foods before I even started this blog. 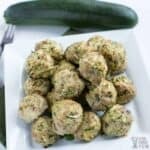 It’s always been a great spot to find low carb ingredients to use in my recipes. 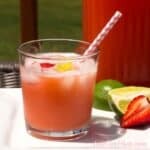 What I like about them is that all the foods they offer are made with natural ingredients. 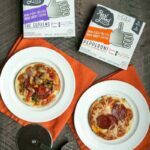 And since they specialize in low carb ingredients, you can find just about everything you need in one spot. They’ve added a lot of great products over the years. Before going gluten-free, I was a big fan of their fresh baked bagels. They are truly amazing and are the best tasting low carb bagels I’ve ever tried. They remind me of the NY style bagels I used to get at a local coffee shop. And this year, they introduced two new flavors: Sesame Seed and Onion Garlic. 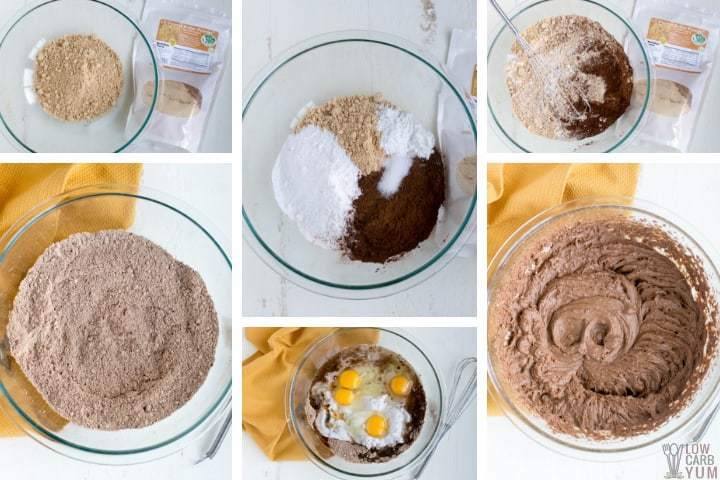 One of the low carb flours that often gets overlooked is peanut butter powder. It’s basically just defatted peanuts. And LC Foods only uses 100% Non-GMO organic peanuts in their peanut butter powder. I find it’s a great substitute for wheat flour when making cakes and cookies. It’s what I use to make my peanut butter blossoms and my peanut butter pie crust. 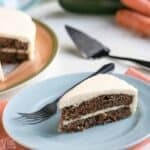 To celebrate the 10 year anniversary of LC Foods, I updated an old peanut flour chocolate cake recipe that I created in my first year of blogging. I wanted to add more peanut butter flavor so this new chocolate peanut butter cake includes a new peanut butter frosting. And since I’ve been low carbing for so long now, I reduced the sweetness of the cake significantly. 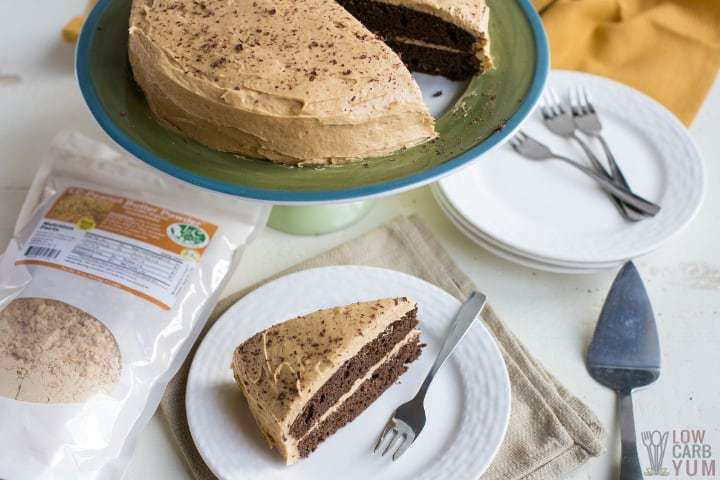 Making a low carb cake using peanut butter powder is just as easy as using a baking mix. The only difference is that you’ll need to mix up the dry ingredients yourself. But, the rest of the process is the same. When using peanut flour for a cake, you will need to add some baking powder and or baking soda for leavening. 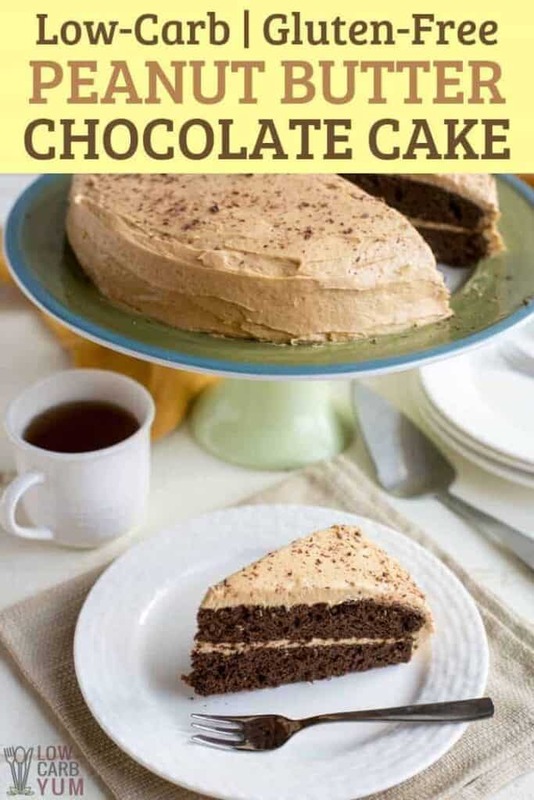 I added both to my chocolate peanut butter cake recipe along with the peanut butter powder, erythritol based sweetener, unsweetened cocoa powder, and salt. After combining the dry ingredients, I added in some eggs, a can of coconut cream, melted coconut oil, and vanilla extract. The eggs keep the cake firm while the coconut cream and oil add moisture. To prevent the cake from sticking to the the pan, I line the bottoms of each 9-inch cake pan with parchment paper. Using a silicone baking pan also helps but using parchment paper and greasing the pan with coconut oil ensures a successful release each time. 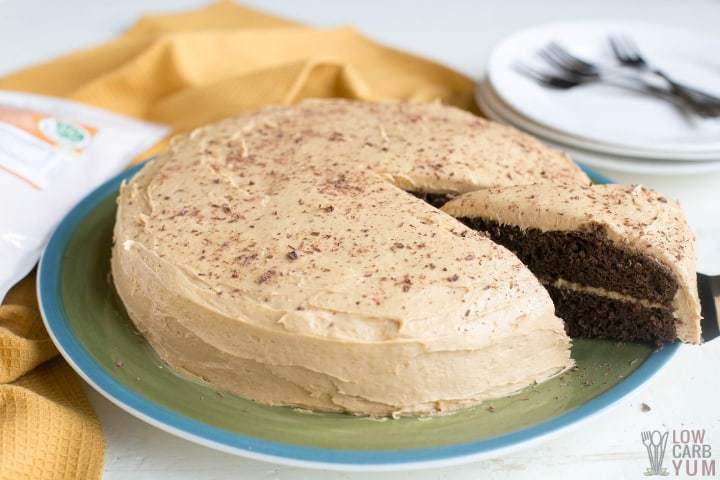 What better way to top off a chocolate peanut butter cake than with peanut butter frosting, right? And, it’s made with a buttercream base that makes it taste so delicious. But don’t worry, it’s sweetened with LC Foods low carb confectionary powdered erythritol sweetener so it shouldn’t impact blood sugar. 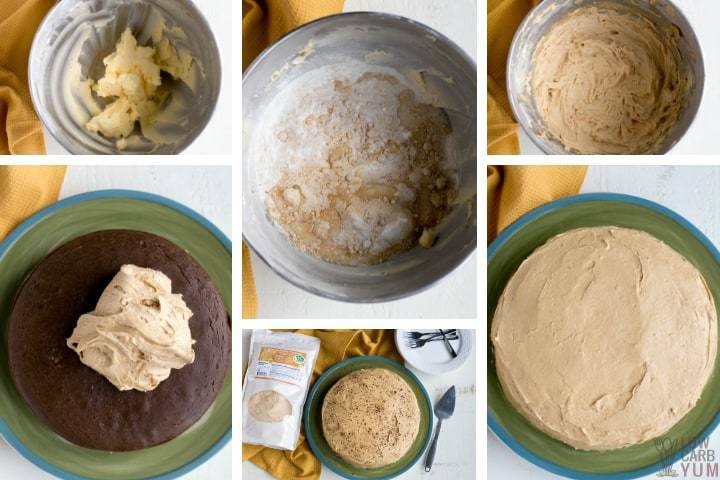 Making the low carb frosting is even easier than making the cake! All you have to do is whip the softened butter up in a large mixing bowl, them add in the powdered sweetener, peanut butter powder, vanilla extract, and low carb milk. I used almond milk, but coconut milk beverage in a carton worked as well. LC Foods even has a low carb milk mix that you can use to make your own zero net carb milk any time you need it! 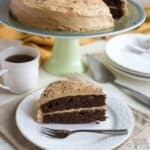 In fact, this tasty chocolate peanut butter cake is perfect served with a tall glass of cold low carb milk. But, it goes great with coffee or tea as well. Just be sure not to overdo your portion size. I cut the cake into 16 slices and get about 10 grams of total carbs per slice. There’s about 4 grams of fiber in each slice so each slice will set you back about 6g net carbs. 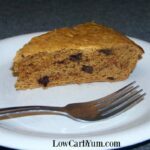 Although this low carb cake is great as-is, there’s always room to make it even better. Since the peanut butter frosting looked rather plain, I dressed it up with some low carb chocolate shavings. 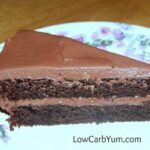 I simply shaved off some of a low carb dark chocolate bar with a vegetable peeler and sprinkled the pieces over the top of the cake. You can also make the cake double chocolate by adding in some sugar free dark chocolate chips. 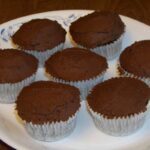 I also find that adding in a little instant coffee or espresso powder really enhances the chocolate flavor. So feel free to add some of that in with the unsweetened cocoa powder. 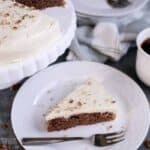 Need ingredients to make this delicious keto friendly cake? You can buy everything you need at The LC Foods Market. They’ve been specializing in low carb foods for over ten years so it’s a great place to shop for all your specialty items. And, be sure to use promo code 10YEAR during January 2019 so you’ll save 10% off your order. I hope you enjoy this easy cake recipe. And be sure to let us know what you think if you do give it a try by leaving a comment below. 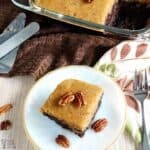 An easy to make low carb cake made with peanut butter powder. It’s a moist chocolate cake topped with sugar free peanut butter frosting. Preheat oven to 350°F. Line bottoms of two 9-inch round cake pans with parchment paper. Lightly grease the parchment paper and sides of pan so cake will remove easily. Stir together peanut butter powder, sweetener, cocoa powder, baking powder, baking soda, and salt in large mixing bowl. Add eggs, coconut cream, coconut oil, and vanilla extract to the dry mixture. Beat with an electric mixer on medium speed about 2 minutes. 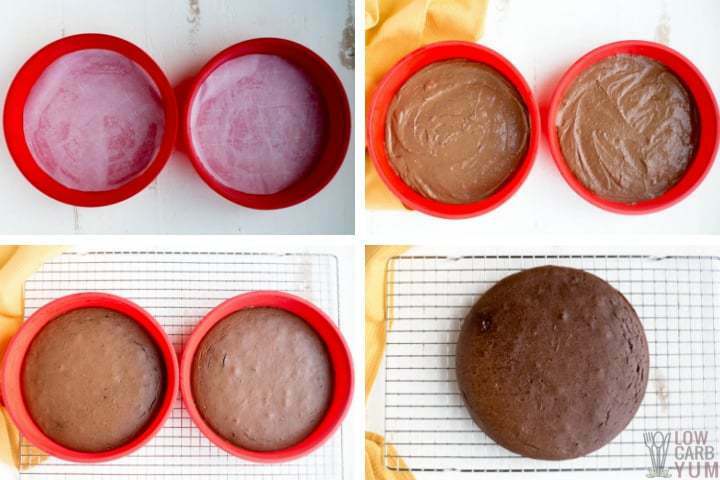 Pour batter evenly between the two cake pans. Bake for 25 minutes or until toothpick inserted comes out clean and cake tests done. Cool on racks for about 10 minutes, then remove cake from pans and cool on rack completely before frosting. Beat butter in large mixing bowl until light and fluffy. Add powdered sweetener, peanut butter powder, vanilla extract, and half the almond milk. Beat on low speed until blended. Then beat on high speed, adding in remaining almond milk as needed to get desired consistency. Add in up to 1/4 cup of low carb chocolate chips to add in a richer chocolate flavor. To enhance the chocolate flavor, add 2 heaping teaspoons of instant coffee or espresso powder.